With over 30 years of experience in constructing, operating and managing structural fill projects and assisting coal-fired utilities in beneficially using coal combustion products (CCPs), Charah Solutions has become the industry leader for innovative solutions. We are known for developing long-term and secure, cost-effective CCP use opportunities that conform to strict environmental requirements with solutions including beneficial mine reclamation and additional beneficial use applications for commercial and aviation projects. Our professional approach and technical expertise ensure a well-managed and compliant CCP project every step of the process. From evaluation, design and permitting to construction, management and operations, Charah Solutions is a total solutions company providing unparalleled service and innovation for the coal-fired power generation industry. One such innovative solution is Charah Solutions’ expertise with structural fill projects. 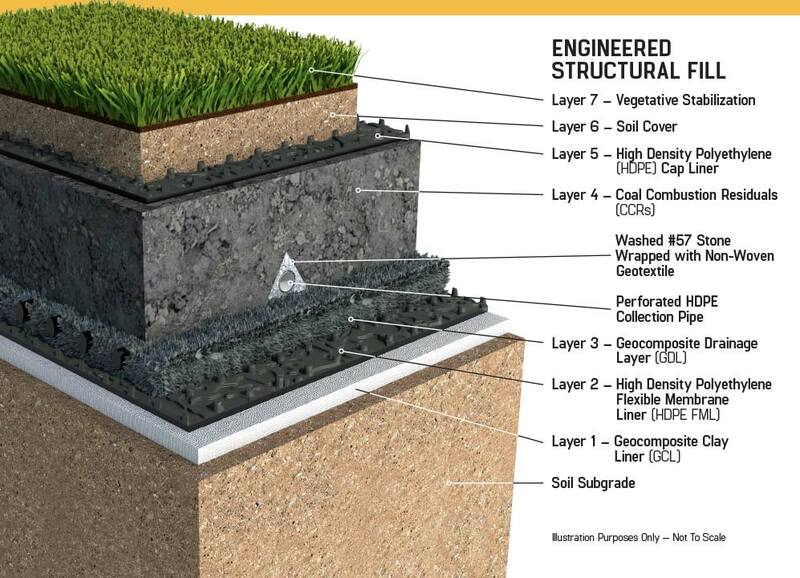 A structural fill is a material that is placed and compacted in accordance with approved design criteria in order to improve land for an intended use. Coal ash is a useful fill material due to its low unit weight, relatively high shear strength and ease of handing and compaction. In a fully lined structural fill, the ash is placed in a series of liners, with the top and bottom impermeable liners being heat-welded together to encapsulate the ash. The completed fully lined structural fill is covered by soil. All projects meet all state and federal standards for a structural fill, including strict groundwater monitoring standards and reporting. We use the best practices, materials and technology for structural fills as seen in our completed coal ash structural fill project at Asheville (North Carolina) Regional Airport.